Perennial. Zone 3. 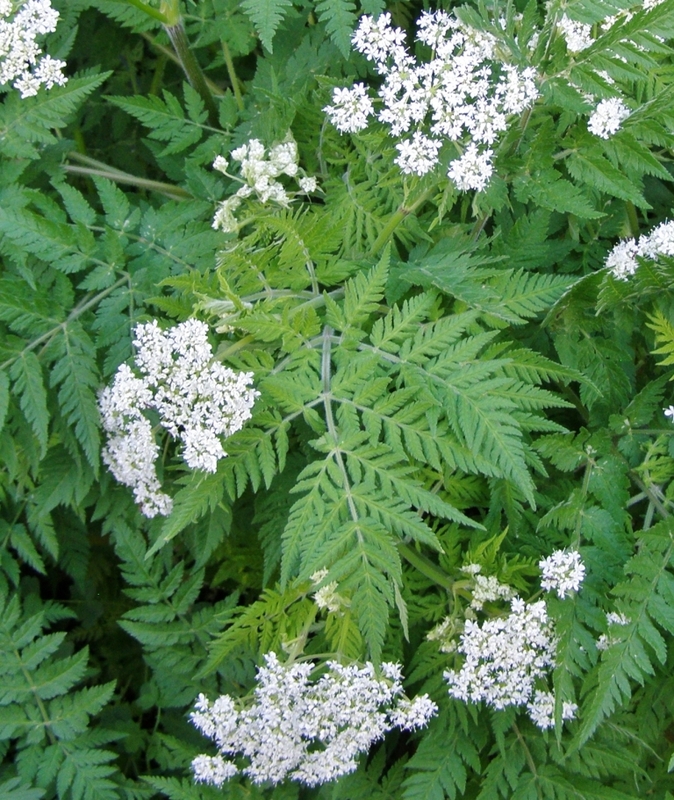 Apiaceae syn. Umbelliferae. Central Europe, the Pyrenees and the Caucasus. Widely naturalized in Europe and Great Britain. Myrrhis is from the Greek, in reference to the similarity of this plant’s aroma to that of the sap of the tropical myrrh tree (Commiphora species), much valued for perfumery. (The true myrrh was traditionally one of the costly gifts presented to the Baby Jesus by the Three Wise Men.) Odorata is from the Latin, “scented”. I have never seen this lovely herb for sale in commercial nurseries in our area, which is why I was so thrilled to find it in a small roadside nursery near Bella Coola way back in 1998. 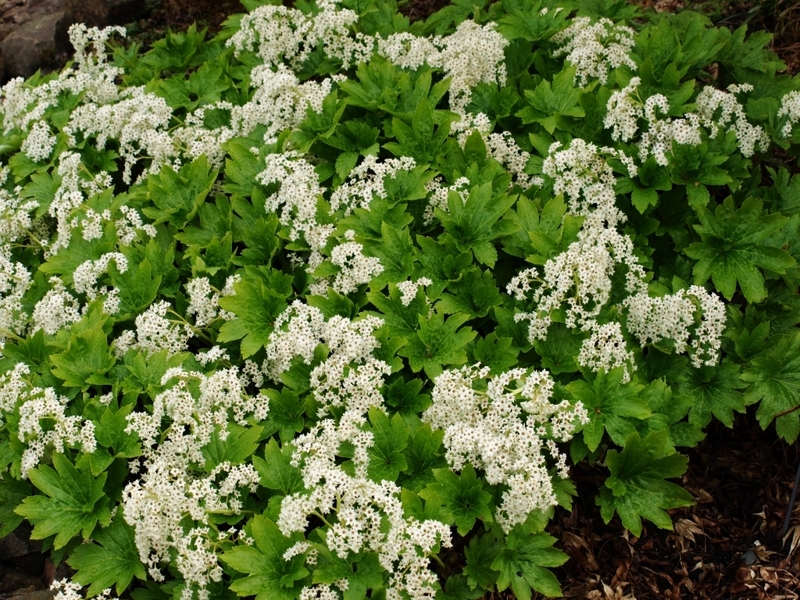 I tucked it into a corner of the flower border, where it has maintained itself ever since, forming quite a vigorous colony of ferny, liquorice-scented foliage accented by lacy umbels of pure white blooms in spring. I’ve transplanted seedlings – very carefully, for Myrrhis odorata has a long, brittle tap root – into various shady spots, where it happily settles in and adds its delicate leafiness to the general green tapestry effect. The blooms are followed by upright clusters of huge, light green seeds, which slowly darken to glossy black. Where happy the plant reaches a substantial size, easily 2 feet or taller, and eventually several feet wide as the foliage expands through spring into early summer. Once blooming is finished, the plant may be shorn back to the ground, where it will re-sprout with renewed vigour and provide a pleasant backdrop for later-blooming flowers. The texture of the foliage is delicately downy – it feels as soft as it looks. I have occasionally added it to cut flower bouquets for its ferny effect, but it isn’t really happy once cut, so I now mostly enjoy it in the garden. 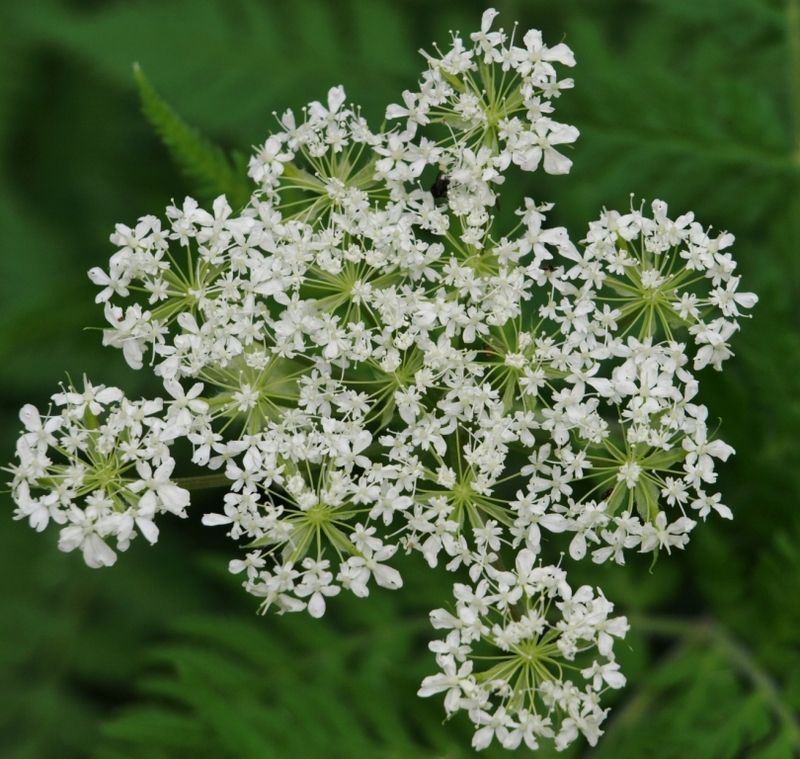 Sweet Cicely has a long history of use as an herb, being strongly anise (licorice-like) scented in all of its parts, and having a very sweet flavour. It is one of the benign “innocent herbs” – edible in all of its parts, and free of potentially harmful components. 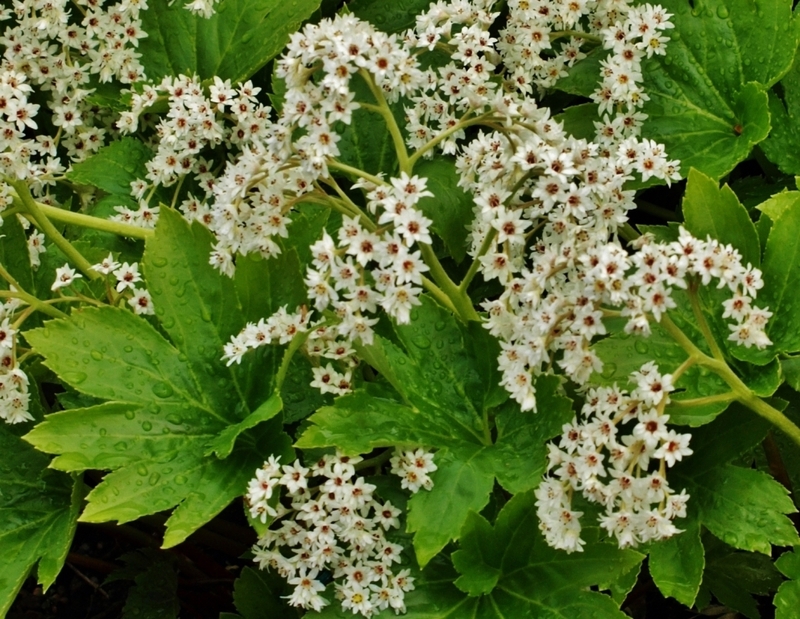 Myrrhis odorata will thrive in the sunny mixed perennial border, as it enjoys fertile soil and summer moisture. It can also be placed in quite deep shade, and, if encouraged to self-sow, will spread to fill in the area under high-pruned shrubs and trees. 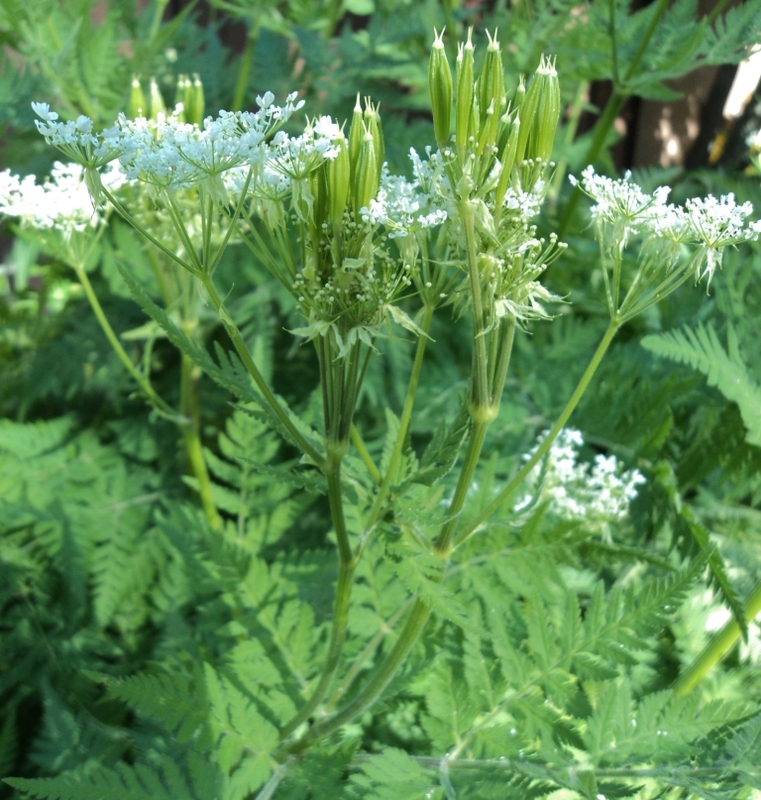 I have not found Sweet Cicely to be particularly weedy – seedlings are easy to identify and easily plucked out – but it is a persistent plant once established (that taproot goes a long way down), so consider its siting carefully. Mature plants do not move well, so container grown starts and young seedlings are your best bet for bringing it into your own garden or for spreading it around. It is a native of Great Britain, a perennial with a thick root and very aromatic foliage, on account of which it was used in former days as a salad herb, or boiled, when the root, leaves, and seed were all used. The leaves are very large, somewhat downy beneath, and have a flavour rather like Anise, with a scent like Lovage. The first shoots consist of an almost triangular, lacey leaf, with a simple wing curving up from each side of its root. 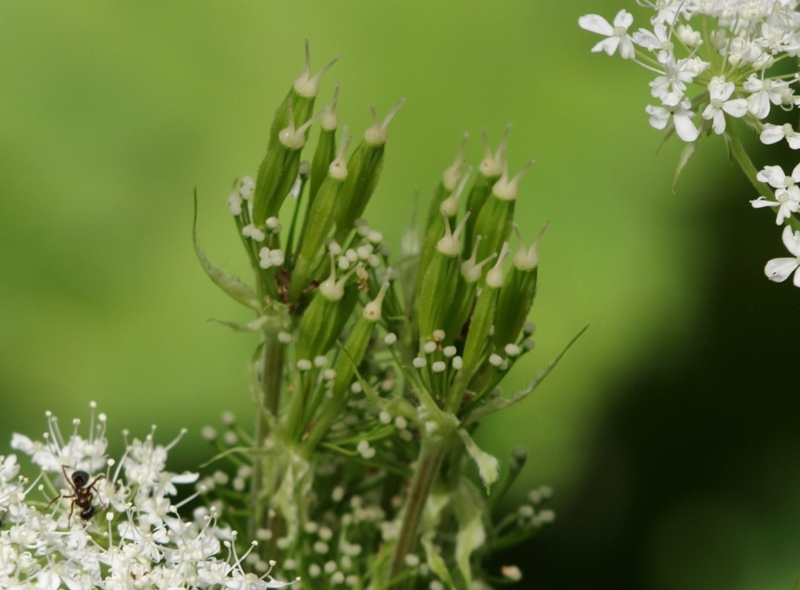 The stem grows from 2 to 3 feet high, bearing many leaves, and white flowers in early summer appear in compound umbels. In appearance it is rather like Hemlock, but is of a fresher green colour. The fruit is remarkably large, an inch long, dark brown, and fully flavoured. The leaves taste as if sugar had been sprinkled over them. Perennial. Zone 3. Lamiaceae. The species is native to eastern North America. This cultivar is a stabilized sport and is found only in gardens. Clump former to 3 or 4 feet tall. Spreads slowly by creeping rootstalks. Sun to light shade; any soil fine; appreciates summer moisture in hot regions. The genus name comes from the Greek: physa = bladder and stege = covering, referring to the inflated calyx at the base of each floret. The common name comes from the hinged sockets which attach each floret to the main cluster; these can be gently twisted and turned, with the new configuration remaining for a few moments until the bloom slowly returns to its original position. 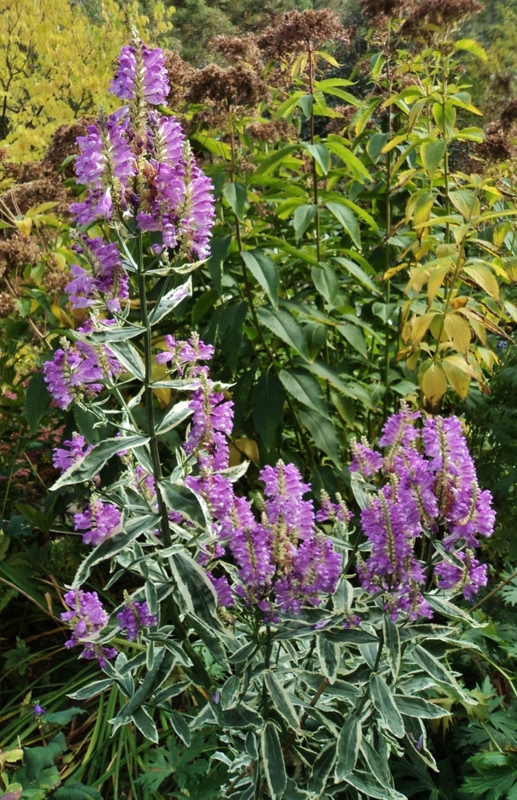 This handsome plant is one of my favourite fall bloomers. 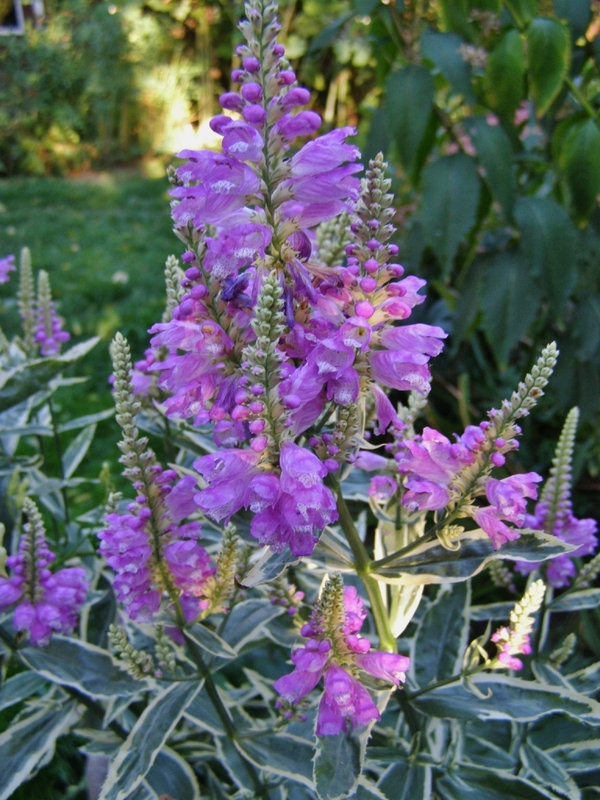 It starts to send out intricate bud spikes in August; these slowly extend and enlarge until mid-September when the first bright purple, cheerfully freckled, snapdragon-like flowers start to open. It is in peak bloom by Canadian Thanksgiving, lighting up the garden in stunning contrast to the yellowing foliage of the perennials around it. Very cold tolerant, and lasts until the hardest frosts which finally blacken it in November. 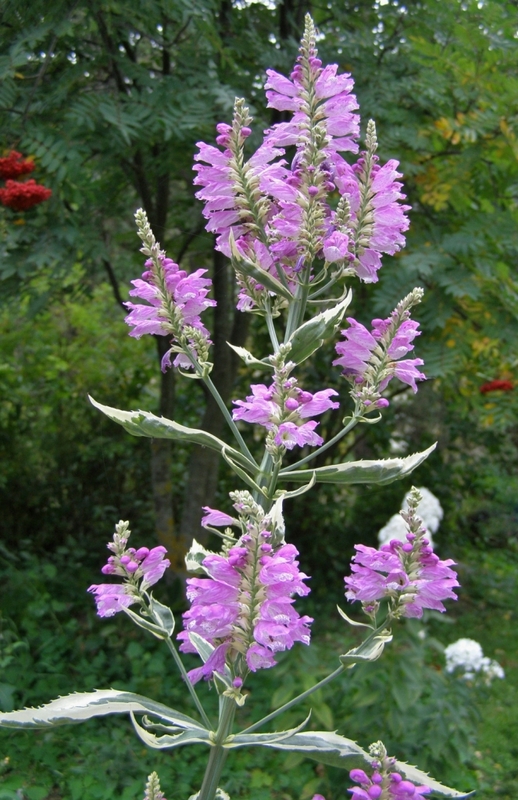 In its native habitat Obedient Plant is found in meadows, open woodlands, and along stream banks. It is very adaptable, though it prefers not to be too dry in summer. The variegated cultivar is restrained in its spread, though it will expand to a sizable clump over the years. Keep an eye on more delicate neighbours. My treasured clump is due for division soon, as it is finally encroaching on its companion, an equally treasured clump of early spring blooming Liverleaf, Hepatica nobilis, after growing side by side with no conflict for the past 5 years. Reaching a respectable 4 feet tall where happy, this plant tends to flop under the weight of its bloom spikes, so an unobtrusive staking mid-summer is a good idea. Years when I forget to do this I am punished for my neglect by the snapping off of full-flowered bloom stalks at their bases. Luckily it makes an excellent cutflower so all is not lost; however its value in the garden exceeds any bouquet so this is a situation one should strive to prevent. As with many variegated plants, it is not as vigorous as its plainer relatives, so will take a few years to reach its full potential. The plus side of this is that it is very maintenance free, despite the staking recommendation and the occasional need for curbing/division in full maturity. 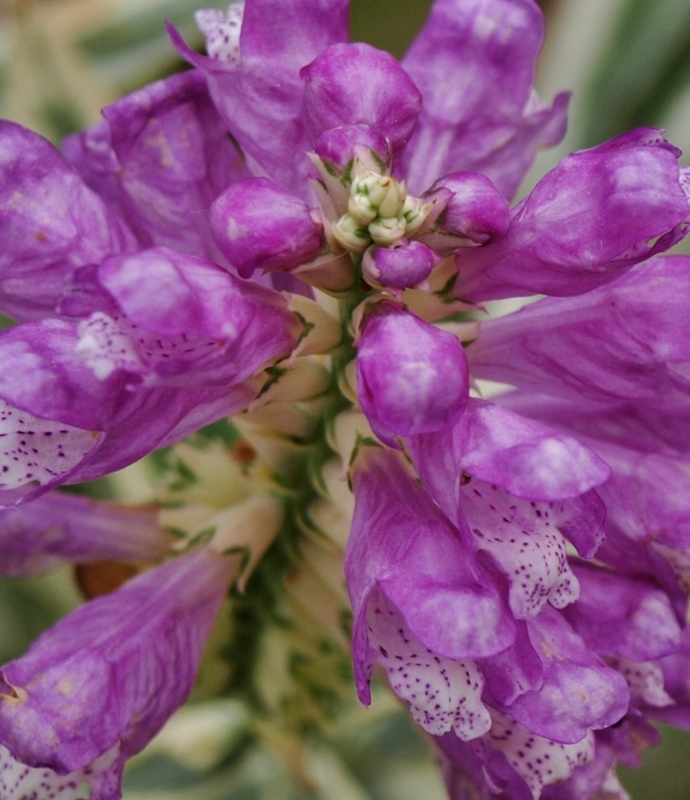 Physostegia virginiana in all of its varieties is long-lived, and completely pest and disease free. A grand plant, not terribly common in Cariboo-Chilcotin gardens, but very suitable for our conditions. Perennial. Zone 3. Aristolochiaceae. Central Europe, Scandinavia, Russia to western Siberia. A creeping groundcover of moist deciduous and mixed forests. Received the Royal Horticultural Society’s Award of Garden Merit in 2007. A.k.a. 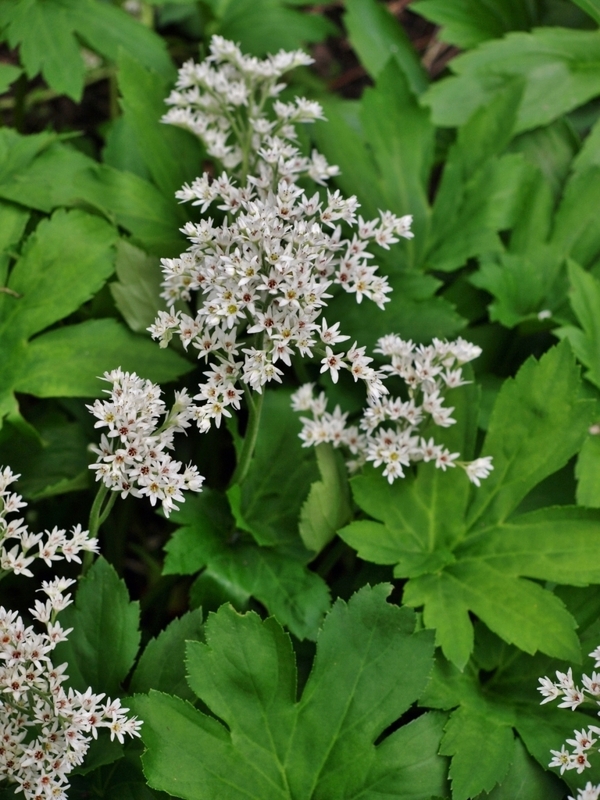 Hazelwort, for its presence under hazelnut bushes in its native woods, and Asarabacca, perhaps in reference to its long-ago use as a medicinal snuff. Thickly textured, very glossy, slightly marbled, heart-shaped foliage is the main attraction to this quietly handsome woodlander. Plants spread by creeping roots and modest self seeding to form dense mats, a slow process but very rewarding in the long term. 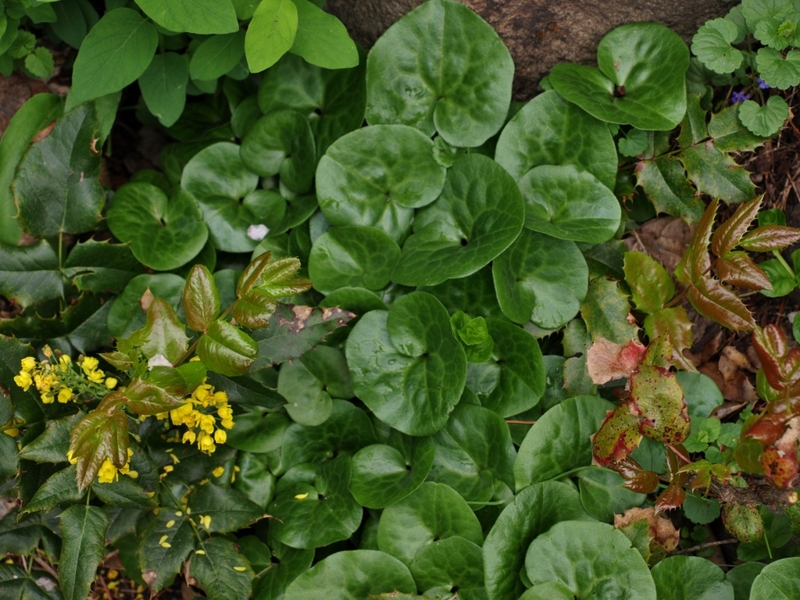 Excellent with woodland ferns and as an underplanting to trees and shrubs, as long as there is sufficient soil and humus to keep the Asarum well nourished. Shade and adequate summer moisture are much appreciated; this is not a particularly drought tolerant plant. 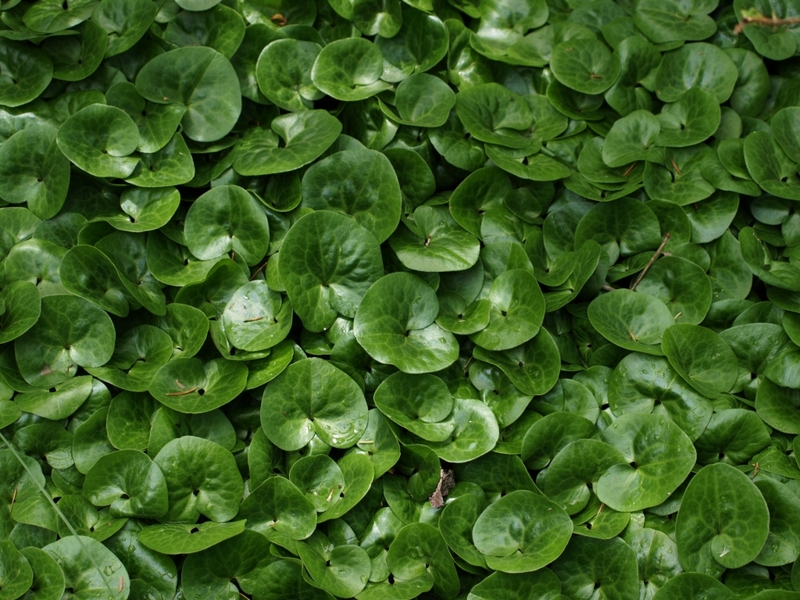 Leaves reach 4 inches or so in height; each plant is about 4 to 6 inches wide or so, so it is best to plant several in a group to get a head start on your own wild ginger patch. The plant is evergreen in mild climates, but dies down over winter in the Cariboo. Do not clip back or pull away the old foliage but leave it be to shelter new growth. Completely maintenance free! The common name comes from the mild ginger aroma of the shallow, rather fleshy roots. The roots were once used medicinally as a purgative, and for various skin ailments, and to induce sneezing. Leaves apparently smell and taste like pepper; I haven’t investigated this myself. 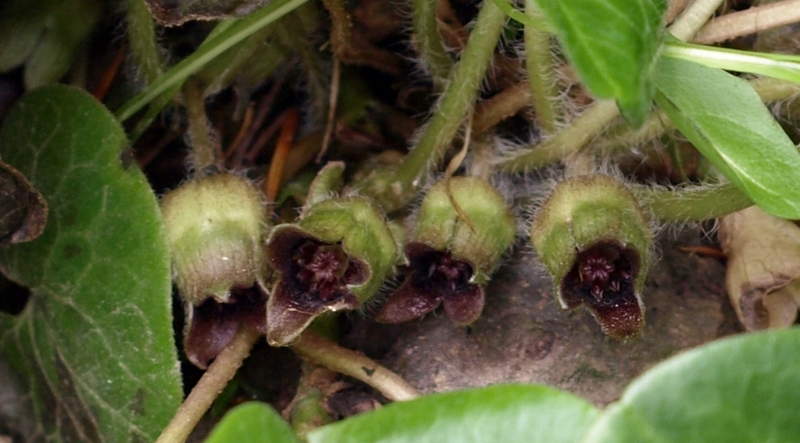 Asarum europaeum is still used in homeopathy. The flowers of this plant are exceedingly unique. They are tiny, three-lobed, tubular structures, and are produced at the very base of the foliage. These lie flat on the ground, and emit a faint carrion-like aroma, which attracts pollinating insects – small flies, ants, and crawling beetles. One thing to note is the woolly hairiness of the stems and outer blooms, in contrast to the glossy smoothness of the leaf surfaces. Perennial. Zone 4. Saxifragaceae. Native to Korea, Northern China and Manchuria, where it grows in cool deciduous forest and on rocky slopes and subalpine ravines. The name Mukdenia comes from the Chinese province of Shenyang, then called Mukden, while the specific name, rossii, is after a Scottish missionary John Ross* (1842-1915) who established one of the first Christian churches in the region. Quietly beautiful in all stages of growth. I fell for this the first time I saw it in autumn-leaf mode, long after flowering, in a coastal garden. The silk-sheened foliage was flushed with crimson, but that was merely what initially caught my eye; on closer examination I saw that the structure and habit of the plant made it a perfectly self-contained woodland garden sort of clump former. A bit of research and a description of the starry white spring blooms merely confirmed my first impression that this was a Very Good Thing, and so I set off on my quest to obtain it for myself. Then, ten years or so ago, I found Mukdenia rossii listed on Kristl Walek’s most excellent Gardens North perennial seed list. A half dozen tiny seedlings survived the rigors of the germination and growing out stage, and I was set. I mulled over a suitable placement for them, and settled on the front of the border on the west side of the house, an area shaded by trees in the afternoon, and well protected by snow from the house roof in winter. The plants approved, and settled in happily, to expand their clump modestly each season and to give me more and more spikes of their tiny white starflowers with every succeeding spring. There they are at the top of the post, and here they are in close-up mode. I occasionally consider stealing some divisions from my cherished little colony, but so far I have resisted that temptation. It is modestly thriving but is in no way outgrowing its allocated space; I think I will leave it well enough alone. Seed remains hard to come by, and I haven’t seen it on Kristl’s list recently. I have managed to germinate a few seedlings from my own plants, but as they are delicate things in the early stages I sadly lost them all before they reached transplanting stage – damping off, too hot a greenhouse, and a day’s missed watering during the busiest time of the nursery year spelled their various dooms. I shall try again, though, because this is something I would love to share with my fellow Cariboo gardeners. So, on to the nitty gritty. Mukdenia rossii forms a compact clump which expands by slowly creeping rhizomatous roots. Rosy-blushed, crowded bud spikes emerge in earliest spring a little before the foliage, and the budding stems and leaves grow a little day by day, until at last, in late April or early May, the first white stars appear. These add to the number day by day, until at last the branched panicles are drooping from their combined weight; the show lasts for weeks, well into June if we don’t have a heat wave. The flowers slowly fade to brown, and the aging seed heads may be left in place or clipped off if you are of the exceedingly tidy sort. Foliage is broad, fan-shaped with serrated edges, and of a most attractive silken texture, with a lovely light-catching sheen. The leaves are well flushed with dark red upon emergence, and though this fades to a uniform green for the majority of the growing season, autumn again brings out the red tints, until the plants disappear under the snow. Mukdenia appreciates humus-rich soil and a fair bit of moisture in the heat of summer, though it never droops. Afternoon shade is definitely appreciated; this can be grown under tree cover in a woodland setting. Once established, bloom stems will reach a foot or so in height, with clumps expanding to 1 or 2 feet. Perhaps nicest in a colony, with several planted together, as it is grown in the University of British Columbia Botanical Garden, and, in a more modest way, my own shady border. I did eventually acquire a small start of ‘Crimson Fans’, but sadly it inadvertently spent a recent winter with the crown crushed under a brick which had tipped sideways – it (the brick) was meant to protect a promising hellebore seedling – and it (the mukdenia) was not looking at all well, so is now residing in a pot, being nursed back to health. This is the one you will likely find if you are yourself scanning the more southerly nurseries. It is also sold under the original Japanese name, ‘Karasuba’. Ignore whatever the zone rating on the tag says – it might be a conservative Zone 6 or 7 – and give it a try. I would be confident to recommend it to at least Zone 4, or even Zone 3 if it can be guaranteed good snow cover. The red colour does fade by mid spring, after which it looks pretty much like the species type, but it is very pretty while it lasts. Nice plant. Worth a try. Born in northern Scotland, Ross served several Gaelic-speaking churches before leaving for China under the United Presbyterian Church in 1872. His ministry deeply touched two areas, Manchuria and Korea. By 1873 he had preached his first sermon in Chinese and had pioneered Manchurian work through wide itineration from his post in Shenyang (Mukden). Known for his generous spirit toward Confucianism and Chinese ancestral rites, he supported the idea of a Chinese church that would not be a Western replica. In 1873, living on the northern border of a Korea still closed to outsiders, he met traders from the “hermit kingdom.” His growing interests produced the first Korean primer (1877) and grammar (1882) in English, the first history of Korea in any Western language (1879), and, under his direction, the first Korean translation of the New Testament (1887). Its unheralded distribution in Korea produced an authentic church there before Protestant missionary itineration began widely within the country. He retired to Scotland because of ill health in 1910 but continued to write and lecture. Perennial. Zone 1. Euphorbiaceae. Native of Europe from southern Germany to the Ukraine, Bulgaria, Greece and Turkey, where it grows in dry forests, mixed meadows, and on rocky hillsides. Euphorbia was named by Linnaeus in 1753 for Euphorbus, the Greek physician of King Juba II (circa 12 B.C.E.) of ancient Numidia and Mauretania (approximately present-day Morocco), who reportedly discovered medicinal uses for the local species. While Linnaeus assigned the species name epithymoides for this plant, it was renamed polychroma in the 1850s by yet another classifying botanist, Anton Josef Kerner, and this name soon took precedence and is the more commonly recognized designation today. 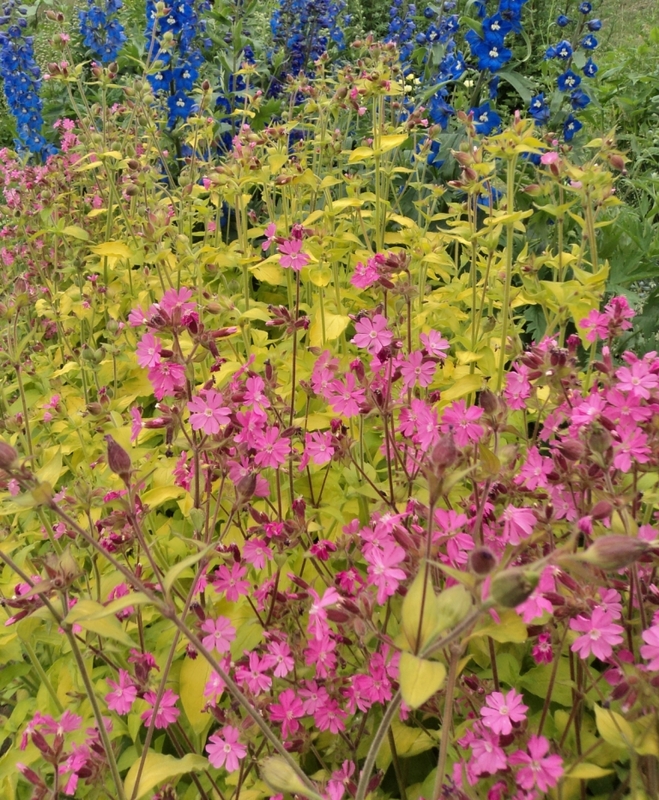 Polychroma is after the Greek polu – ‘many’ – and xrwma – ‘colour’, a reference to the shaded colours of the bracted stem tops and ornate flower clusters. Sun to part shade; average conditions. This appears to be a deer resistant plant – something to note for those of you afflicted by these increasingly bold and destructive garden pests. It’s well into May, and everywhere I go these days I note the unmistakably glow of this unique specimen plant. It flourishes happily in mature, well established gardens as much as in newer, more avant-garde plantings accenting newly built homes in the posher parts of town. When (and where) the lilacs bloom, then (and there) too the cushion spurge. Cushion spurge grows to 18 inches tall and 2 ft. wide where happy – which is most places, as it is an adaptable, good-natured thing. 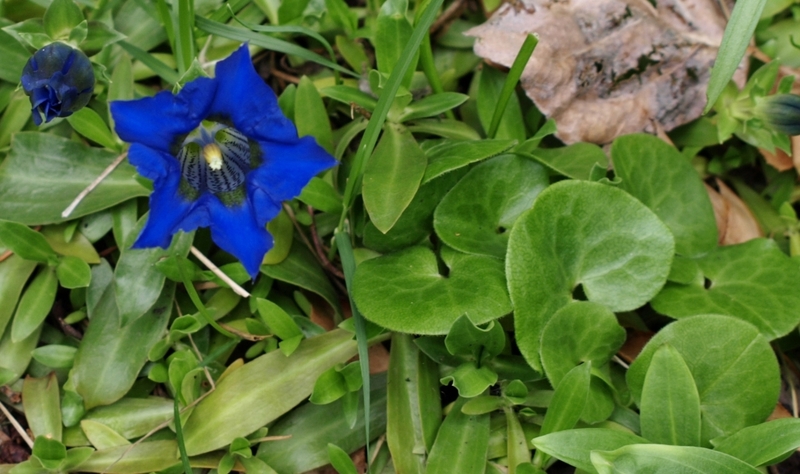 It thrives in sun to part shade, and in modestly moist to dry soils, though it doesn’t care for overly soggy ground. Once established it is very drought tolerant, though it will definitely appreciate the occasional soaking in hot summers. Clumps of woody-based stems are lined with whorls of soft green, rounded foliage, which are tipped with the modified leaves commonly referred to as bracts, though the correct term in this case is cyathium leaves. These turn a vivid, glowing, chartreuse-yellow, centered with clusters of tiny, even brighter yellow petal-less florets. These clusters include nectar-rich glands – nectaries – which reward foraging pollinators. I have not noticed that bees are particularly attracted to the blooms – though they do visit – but the highest traffic seems to be small flies, and ants and other crawling insects. After blooming and pollination – peak bloom time is all through May and into June – the yellow colour fades to a uniform green. Seed capsules form which eventually pop open later in the summer, catapulting seeds out into the garden, where they sprout in modest numbers. Seedlings are easily removed or transplanted to more desirable locations, where they quickly settle down to the business of growing and forming yet another perfect little globe. Cushion spurge remains attractive through summer, and can be left to fend for itself or clipped back to produce fresh foliage. The plant fades to yellow in the autumn, frequently showing a red stage before the leaves finally wither after the last, hardest frosts. Several “improved” (or perhaps one might say “enhanced”) cultivars of Euphorbia polychroma are popular in the nursery trade, including the burgundy-blushed ‘Bonfire’, a patented selection of the Euphorbia polychroma ‘purpurea’ sport which has been grown as a desirable rarity for many years, sometimes under the cultivar name ‘Candy’, and the white-pink-green ‘First Blush’. 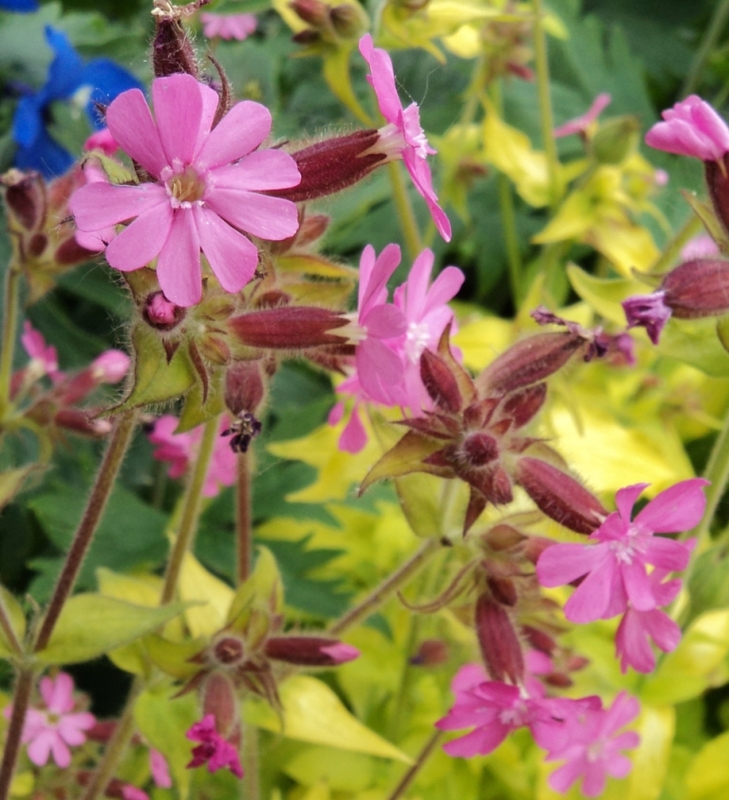 Of these two types I much prefer the red-leaved variety, as I’ve noticed that the white-variegated form is much less vigorous, and seems to show a high percentage of deformed and puckered leaves. 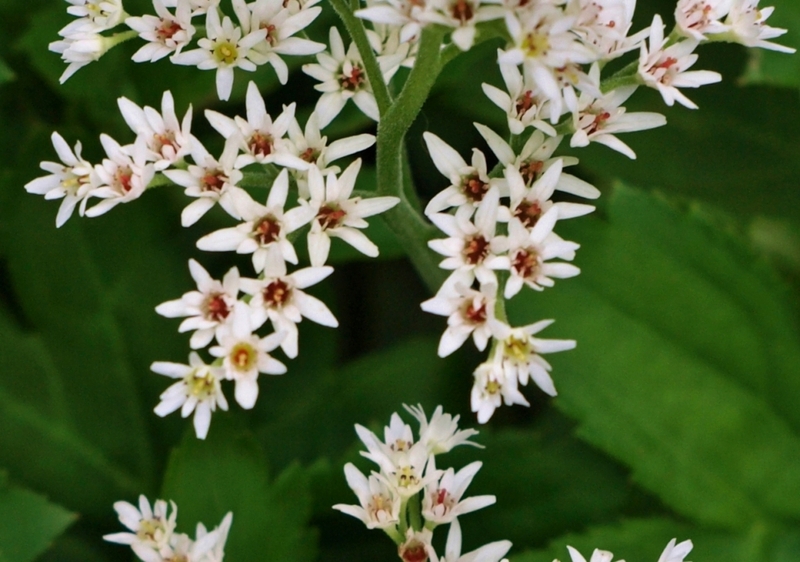 The common form of this handsome plant is a venerable garden old-timer, having been grown for centuries both for ornament and for occasional medicinal use. John Gerard’s masterwork The herball, or Generall historie of plantes, first published in England in 1633, reported of Spurge that “…the juice or milke is good to stop hollow teeth…” A modern commentator theorizes that the poisonous latex probably destroyed the nerve endings. 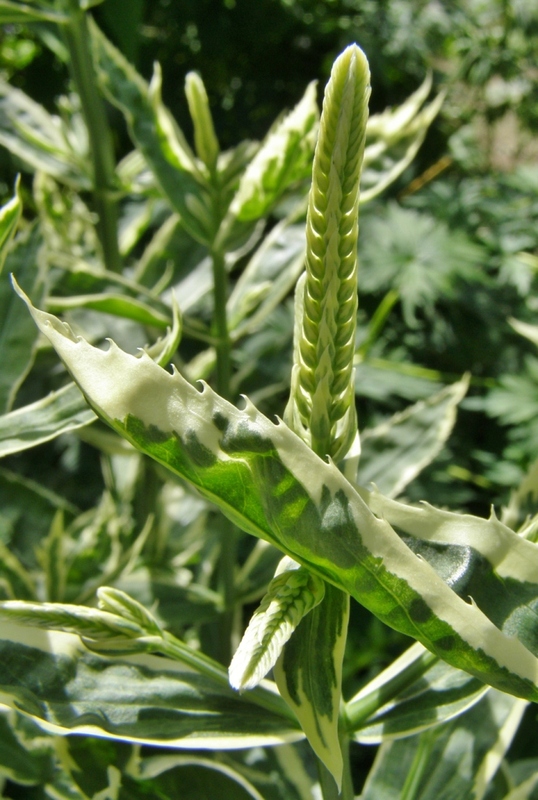 The specific species of Euphorbia referred to is unknown, though all share the same milky (and irritating) sap. Another medicinal use, and the origin of the common name of this very large genus (over 2000 species, found worldwide), is that of a purgative – a vigorous laxative – though one that was prescribed with some caution, as the violence of its action could be fatal if the decoction was too strong. From the French medical term describing the process, “espurgier”, came the English “purge”, and hence “spurge”, or so the theorizing goes. Though we no longer find ourselves partaking of the plant in any way except that of enjoying its attractive appearance, it is a good idea to treat the plant with sensible respect. The sap of some species was used to beautify the complexion, and to remove warts, but the herbalists warned about the dangers of letting it get into the eyes, as it could cause severe damage, even blindness, a caveat which has been brought forward to the present day. Some people experience a skin rash from handling the cut foliage, so it is best to be on the safe side and use gloves while pruning. Avoid contact with the milky sap, and supervise young garden visitors if they are too young to heed “don’t touch” warnings. One final note. Euphorbia polychroma/epithymoides was awarded the Royal Horticultural Society’s prestigious Award of Garden Merit in 1993, confirming its excellent ornamental qualities to the world at large. Experienced gardeners will have taken this as a confirmation of what they already knew. This is a quietly grand garden plant.